Let us start with the conversion of the OLK14messages to different file format. Download and Run Software . Add File - This option allows user to export single DMG File consisting of OLK File. Add Folder - This option allows user to convert multiple OLK File within Mail Identity Folder. OLK Converter allows user to Preview & Export selective Files. You can also select among various options to convert into various format such as PST, EML, MSG, MBOX, PDF, & HTML. Select the desired file to be exported & Choose OLK14 file to be converted & Select the Export button on navigation bar. Choose the output file from default option provide there in which OLK15 messages need to be converted such as PST, EML, MSG, HTML, VCF, MBOX etc. Provide the destination to store the converted file and click on Export Buton. I am working as the assistant customer support engineer in the company which provides services in the field of telecommunication. I have to interact with 100-200 peoples by email on the daily basis and help them to nullify their problems. The complete communication details are stored in the default database. Due to corruption in disk storage device, I am unable to access my email account and also lost my crucial information. I have only encrypted backend files of my email account and I want to regenerate my email using this files and desired to convert it into another format so that I can easily view it. Can I convert my complete OLK emails to PST? Is OLK Converter sustains metadata? What is file size limitation for OLK to PST converter? Do I need Mac Outlook for conversion? Information in the form of data is very crucial for any organization. The data can generated from anywhere whether it is clients information, company annual statistics report. It is moral responsibility of the organization to prevent and secure the client data to being spammed. Every one facing problems in securing or preventing data from corruption. But some how it gets corrupted and thus affects your daily routine activities. There is no need to panic when you lost your crucial data or it gets corrupted. You can retrieve your data from backend OLK files also. OLK file is a backend file created by mac Outlook for each transaction. When the data of Mac outlook get corrupted you can regenerate it using OLK converter. The OLK converter is the professional tool to convert olk14messages to PST, EML, MSG, MBOX, PDF, HTML, ICS & VCF file format. You can easily convert complete data to PST file format and view it in MS Outlook. The OLK converter maintains the metadata of OLK files. There is no limitation to convert olk14messages to PST. It is safe to use the OLK converter because it is verified by different agencies on multiple aspects. Yes , You can definitely use OLK14messages Converter to Convert OLK14Messages to PST File format. Apart from olk14messages , OLK Converter convert OLK15Messages to EML, MSG, MBOX, HTML & PDF file format. What is the file size Limitation of OLK14messages Converter? Is there any possibility of corruption while converting OLK15messages to PST? There is the negligible possibility of OLK15messages file corruption. The OLK to PST converter proceeds the conversion process in the secure and isolated environment. I was unable to view my emails due to mild corruption in my Mac Outlook file. Someone recommended me on technical forums to use OLK to PST Converter. I tried the demo version of OLK14Messages Converter and found it more proficient and enriched with high-quality features. I easily convert OLK14 messages to PST. Thank you very much for Developing Such high-quality tool". I recently converted my huge collection of OLK file comprising of OLK14Messages and OLK15Messages to EML. This was only possible with the help of OLK to EML Converter. It effortlessly converts my all OLK15Messages to EML. Now I am able to view my OLK file on multiple platforms without any compatibility issues. Brilliantly developed and innovative Software. Thanks a lot for such outstanding OLK to EML Converter tool.e. OLK extension based files are used for individually maintaining the data of a respective profile for Mac Outlook. OLK14 files are stored in the Identity folder of the corresponding profile to which it belongs. It can be very useful in case the OLM file get corrupted or deleted . Then in this situation, you can easily retrieve your data by OLK files. To access your data you have to convert it to other file formats. OLK converter helps you to convert bulk olk14messages to PST/EML/MSG. First, download and install the Mac OLK Converter for MailProplus. Then, launch the application. To add the OLK folder, click on the Add Folder button. The added folder will be displayed on the centre panel of the software. After that, click on the Next button. Date Filter: Selectively migrate emails based on a date range by setting a ‘to’ and ‘from’ value. Maintain Folder Hierarchy: The Mac OLK Converter makes it optional to keep folder structure of emails in output MSG or EML format. Naming Convention: Set a pattern to name exported .eml or .msg messages according to subject, date or serial number. Export Option: Choose to keep certain mailbox items like emails and exclude contacts and calendar to prevent needless data conversion. Date Filter: Simplify Outlook for Mac emails based on the date they were received. Maintain Folder Hierarchy: It is optional to keep the folder structure intact in Mac OLK Converter for MailProplus to save time. Next, click on the ‘...’ button under Select the Destination Path. Set a folder location where the exported files will be saved. This path will be reflected in the text box next to button after selecting it. 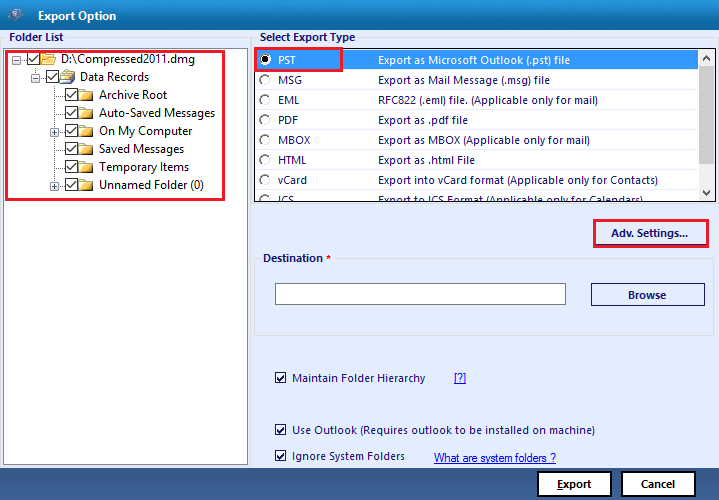 Finally, click on Export button to Convert OLK14Message to PST, EML or MSG. This will start the migration process. The OLK to EML Converter displays the live status report with destination path, email count and the failure count. The report also includes calendar count and contact count with the size of the file and progress status. Once the OLK14Message to EML conversion is complete, the Export status turns to ‘Completed’. The complete process report can be saved in CSV by clicking on View Report. This will show the OLK to MSG Converter report saved on a path on the Mac machine. Double-click on the file to open it in a spreadsheet document. It has the same details of destination path, item count, failure count, size and export status. A company that uses Outlook 2011 for Mac has lost its identity folder due to a recent corruption. The only file that remains is the OLK folder that needed to be exported from OLK14Message to EML format. This is the only way the emails can be read from an OLK14 or OLK15 folder. Different parts of an email message are saved in different OLK files. An OLK14 Message Converter is needed to scan OLK files to prepare an OLK14 Message in a readable format. It can then be converted to Outlook PST, MSG or EML format. The .olk14Message stores header information while .olk14msgAttach saves attachments and .olkMsgSource contains email body. A Mac OLK Converter to combines all these files and save email file without any changes to data. Will the data integrity be maintained when transferring OLK files to PST format? Can the OLK to EML Converter import multiple .olk14Message files in bulk? 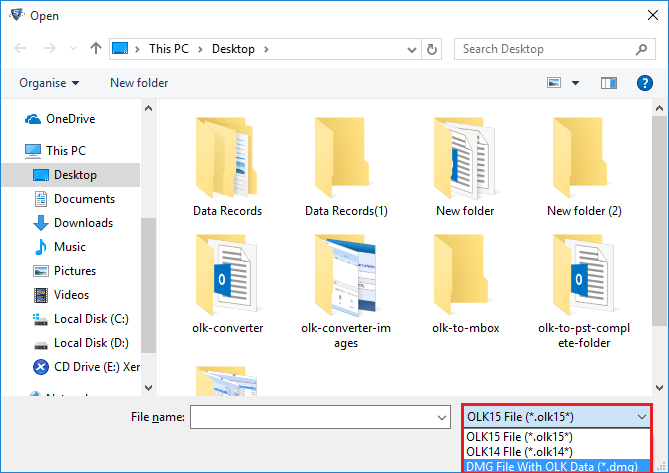 Is there file size limitation for the OLK14 or OLK15 folder files that can be uploaded to the tool? Does the Mac OLK Converter require Outlook installation to work? What versions of Macintosh operating system are supported by the tool? The Convert OLK14Message to EML tool is a perfect software to recover all emails from OLK14 or OLK15 folder. It scans every type of OLK files and generates an email item from an OLK14Message. 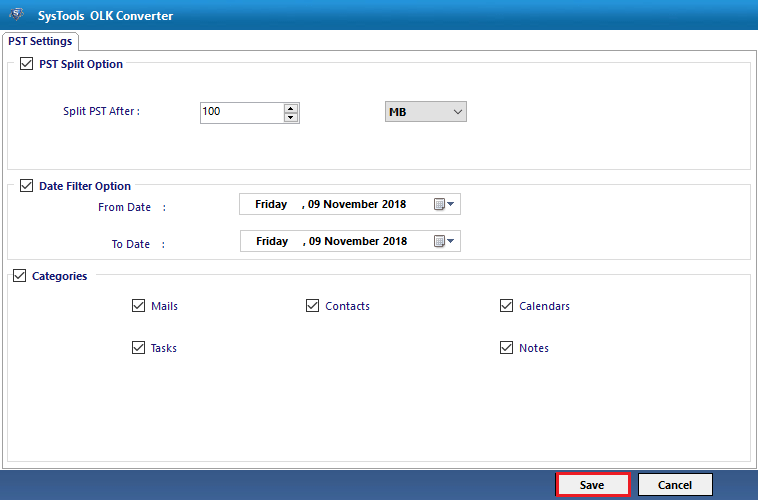 The OLK Converter reads .olk14Message for emails, .olk14event for calendar items, .olk14contacts and .olk14notes etc and exports to PST. It is user-friendly, simple tool designed to work even with non-technical users. The OLK to PST Converter Free provides all the functionality of a full version. The only difference is that the free version can only migrate 25 items from OLK14Message to EML format per folder. The tool works with both Outlook 2011 and 2016 for Mac computers. It can transfer multiple .olk14Message file in bulk without affecting the data integrity or email formatting. 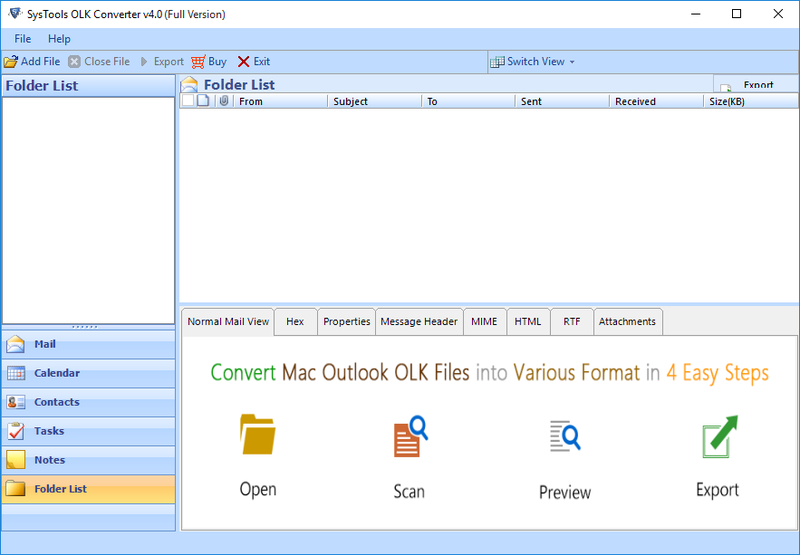 The OLK Converter does require necessary Outlook installation to work. There is no known file size or number limitation implemented by the tool. The tool works with all latest versions of Mac OS X 10.10. The Convert OLK14Message to EML tool is also compatible with Macintosh OS X Yosemite Version 10.10.4 and 10.10.5. This also includes the Mac OS Sierra Version 10.12.3. The OLK File Converter is completely safe and secure to use. No data is changed or saved anywhere by the tool during transfer. The email data is neither used by the tool nor by the company. How to Convert OLk14Message to PST, MSG and EML Using OLK Converter For Mac? Click on Add File Button in Menu Bar. Apply Naming Convention or Date Filter as per need. Click on Export & Your file get converted to desired file format. What are prerequisites to using the OLK Converter? 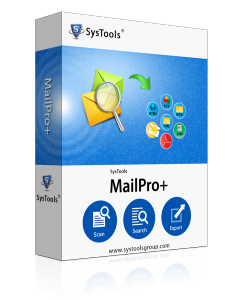 The tool requires mandatory Microsoft Outlook 2011 or 2016 installation on Mac machine. It also requires a Java development kit 1.8.0_101 to be installed on the migration machine. Does the OLK to PST Converter Free version contain any virus or malware? The tool is completely safe and secure to use. Download from the company website as it provides completely healthy software without any malware or viruses. Is there a possibility that the OLK to MSG Converter can repair corrupt OLK files? The tool can read and convert healthy OLK files left after deleting an Outlook for Mac profile. It does not work with corrupt files. ‘It is a great software! We tried the OLK to PST Converter Free to check whether the tool worked well with OLK15 files. It successfully extracted complete email data from OLK folder within seconds. We immediately purchased the full version with a license. Using the OLK File Converter we have recovered more than 300+ files. Thanx! The OLK to MSG converter has a simple interface and it is designed for professionals and commercial purposes. It provided us with multiple options to save OLK14 messages. It can convert OLK14Message to PST in high-quality. There is no data loss and even the folder structure was kept intact. The email formatting remained the same and so did all email attributes. Great Stuff! The Mac OLK Converter for MailProplus is designed to migrate Outlook profile temporary data. It captures multiple OLK files containing different email message parts saved in an OLK folder. This is a temporary folder created by Microsoft Outlook for Mac for a particular user profile. The OLK14 Message Converter understands the .olk14Message or .olk15Message files. It extracts message body from OLK14 MSG source and combines it with .olk14msgAttach file for attachments. The OLK15Message to PST Export tool then to save email data to PST/EML or MSG format.